Technology patented by Renmatix enables the manufacture of industrial sugars from biomass on a scale that is commercially cost-effective. Renmatix, a leading technology licensor for the conversion of biomass into cellulosic sugar, is a commercial partner of CenUSA Bioenergy, and has patented a process that could lead to cost-effective production of industrial sugars from cellulosic biomass on a commercial scale. This is an important step in identifying opportunities to commercialize perennial grasses for uses beyond biofuels. Biomass can be converted into the cellulosic sugars used to make biofuels, and biochemicals that replace petroleum-based chemicals in a wide range of products such as paint, make-up, and diapers. But the conversion process has so far been expensive. Conventional processes that convert biomass into industrial sugars use enzymes or acids—so-called “consumables” that add cost—and require expensive equipment. These technologies typically produce smaller volumes of sugar and at greater expense, so the sugars are feasible only for high-priced consumer applications such as health and beauty products. 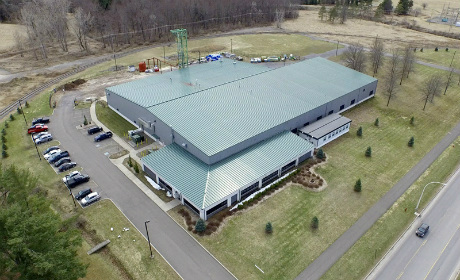 The first step in the Plantrose process, extraction of hemicellulose, takes place in Renmatix’s new Feedstock Processing Facility in Rome, New York. Photo: Renmatix. Renmatix’s patented Plantrose process™ uses supercritical water (water brought to a high temperature and pressure) as a solvent and a catalyst to break down biomass into useable industrial sugars at an affordable cost. These sugars are used to manufacture biochemicals such as acrylic acid, paraxylene, and succinic acid that can be cost-competitive with petroleum-based products including polyethylene, surfactants, polypropylene, and ethylene glycol. They can also go into the production of transportation fuels such as ethanol and butanol. The Plantrose™ technology can process cellulosic biomass from a wide range of sources, but Renmatix exclusively uses sources that don’t compete with food. Nonfood sources include woody plants such as willow, corn stover and other agricultural residues, and grasses grown for energy such as switchgrass. Another important source is wood waste such as sawdust, branches, and slash from forestry operations. The wide variety of possible inputs makes the technology relevant for many different types of biomass available and applicable worldwide. In the Plantrose™ process, water and biomass are heated to release hemicellulose, one of three biopolymers found in plant cell walls, which is extracted to make xylose. The remaining cellulose and lignin biopolymers are mixed with water and heated to high pressure and temperature to release glucose. The xylose and glucose, known as C5 and C6 sugars respectively, can be fermented to fuels or chemicals. The lignin residue can be burned to provide thermal energy for the process. However, CenUSA researchers are helping Renmatix identify higher-value applications of this co-product. Supercritical water exists in a state between liquid water and steam, which gives it special properties as a solvent and catalyst to speed up chemical reactions. This means that small reactors can produce large quantities of cellulosic sugars at lower capital expense, so that relatively small processing plants can be distributed around a region near the biomass supply, rather than building one large centralized plant to which all the biomass must be shipped. In addition, the chemical and physical properties of the supercritical water allow it to be quickly and easily adjusted for reacting with different types of biomass. It uses the lignins left over after the sugars are extracted for energy or value-added products. It recovers heat by recycling steam and hot water, thereby keeping energy costs low. 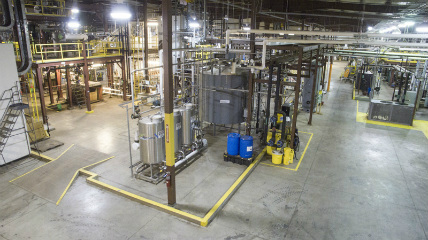 At Renmatix’s Integrated Plantrose Complex in Kennesaw, Georgia, samples of sugar and lignin are made from woody biomass for evaluation by the companies customers. Photo: Renmatix. Renmatix applied for its first patent for the Plantrose™ process in 2007, and thus far holds 30 patents worldwide on different aspects of the process. Its licensing model enables partners to build biorefineries on a larger scale globally that use the Plantrose™ process to make biochemicals replacing petroleum-based components in such products as paint and laundry detergent. A typical commercial biorefinery would produce up to 300,000 tons of sugar annually. 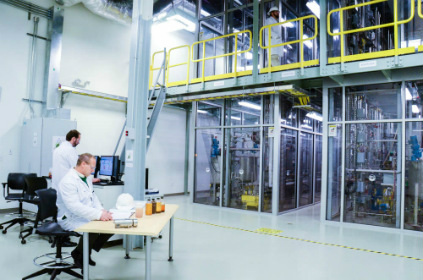 To commercialize the process, Renmatix is analyzing a range of CenUSA biomass feedstocksat its Bioflex Conversion Unit, a processing facility located at the company’s King of Prussia, Pennsylvania, headquarters. Those feedstocks include Liberty switchgrass, big bluestem cultivars, a low-diversity grass mixture, Indiangrass, and corn stover. Renmatix also operates a production facility in Georgia, called the Integrated Plantrose Complex, which converts woody biomass into samples of sugar and lignin for its partners and customers to test and evaluate. Most recently, Renmatix acquired the existing assets of the former Mascoma corporation’s 56,000-square-foot manufacturing facility in Rome, New York. At this new Feedstock Processing Facility, the first step in the Plantrose™ process, extraction of hemicellulose, takes place. Renmatix has signed joint development agreements with Total SA, a French energy group; the world’s largest chemical company, BASF, based in Germany; UPM, a Finnish forestry company; and Waste Management Inc., a U.S. company. These companies are testing the Plantrose™ process to manufacture specific bio-based products on a commercial scale. The first step in the Plantrose process, extraction of hemicellRenmatix’s new Feedstock Processing Facility in Rome, New York. Photo: Renmatix. By lowering the cost of converting biomass into cellulosic sugars and ramping up the volumes that can be produced, Renmatix can help companies transition from an economy based on fossil fuels into one based on renewable biomass.